The following document is part of a series of Bilderberg documents obtained from academic institutions, diplomatic libraries and legal archives spanning a large portion of the group's history. 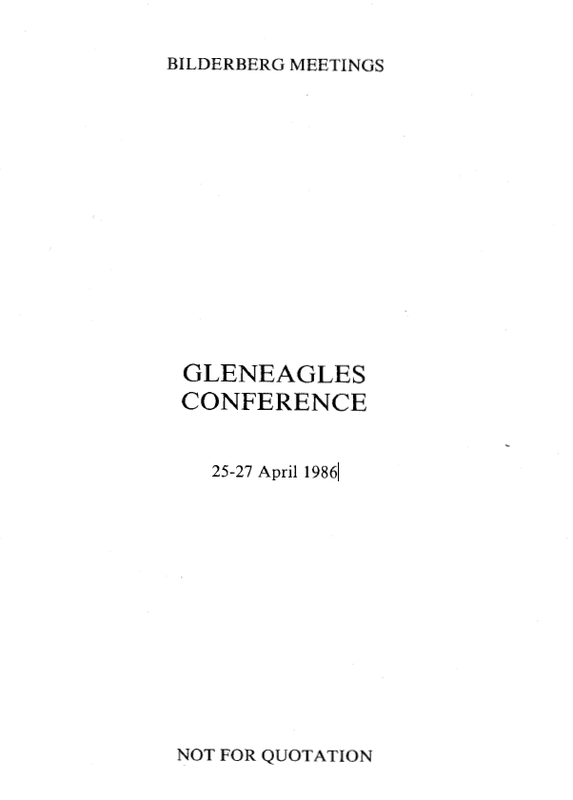 The thirty-fourth Bilderberg Meeting was held at the Gleneagles Hotel, Auchterarder, Perthshire, Scotland on April 25, 26, and 27, 1986. There were 109 participants from 19 European countries, the United States, and Canada. They represented government, diplomacy, politics, business, law, labor, education, journalism, the military, and institutes specializing in national and international studies. All participants spoke in a personal capacity, without committing in any way the organizations or governments to which they belonged. As is usual at Bilderberg Meetings, in. order to permit frank and open discussion, no reporting of the conference proceedings was allowed. In opening the conference, Lord Roll of Ipsden, the Chairman of the Bilderberg Meetings, welcomed the participants to Gleneagles. He then read the text of a message of thanks and good wishes, sent on behalf of all those at the conference, to Her Majesty Queen Elizabeth. The Chairman also took note of the death of Olof Palme, who had attended many past Bilderberg Meetings and had been scheduled to be a participant and panelist at the Gleneagles Conference.